The last decade has seen the Canadian economy weather the financial crisis and global downturn of 2008-09, and has seen both increases and drops in commodity prices. Nevertheless, on net the Canadian economy has created jobs over the course of this period. From total average monthly employment in 2007 of 16.743 million jobs, employment in 2017 for the January-to-October period currently averages 18.350 million jobs—an increase of 9.6 per cent. Economic change means jobs are being both lost and created at the same time, but employment growth over time means the net effect on the overall number of jobs is positive. At the same time, there are regional differences in economic performance as a result of resource endowments, government labour market and tax policy, and market effects on local economic conditions. And that means that there are also differences in job-creation rates. The chart below provides a quick snapshot of the differences in job-creation over the last decade across Canada’s major census metropolitan areas (CMAs) as well as the provinces. The data is from Statistics Canada, Table 282-0135, Labour Force Survey estimates (LFS), by CMA based on 2011 Census boundaries, three-month moving average, seasonally adjusted, monthly data. Canada’s provincial job engines were in the west with employment growth in Alberta (15 per cent) Saskatchewan (13 per cent) and British Columbia (12 per cent) leading the pack. Quebec was fourth at 10 per cent while Ontario and Manitoba tied for fifth place (9 per cent). The Atlantic region lagged behind, with New Brunswick actually seeing a 1 per cent drop in employment over the 10-year period. As for Canada’s CMAs, Regina led the pack at 27 per cent employment growth followed by Edmonton (24 per cent) and Kelowna (23 per cent). The top 10 CMAs for job-creation ranged from a high of 27 per cent in Regina to a low of 16 per cent for Toronto. Four Canadian CMAs saw their employment shrink—and they were all in Ontario. The worst performing CMA was London, which saw its employment shrink by 3 per cent between 2007 and 2017. Next worst were Thunder Bay and Sudbury, which saw their employment shrink by nearly 2 per cent each followed by Peterborough, which saw its employment shrink by just under one half a per cent. 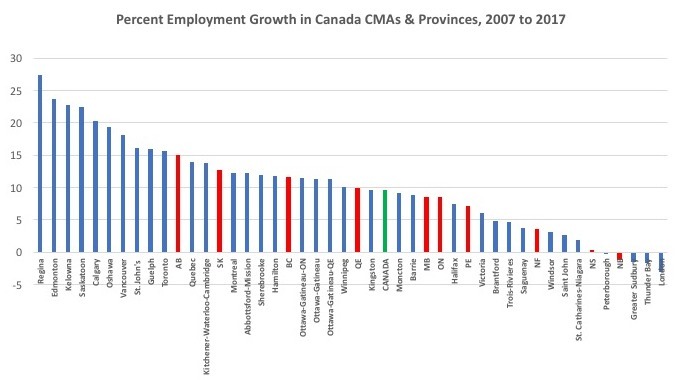 For employment growth, of the top 10 performing CMAs, six were in Western Canada (Regina, Edmonton, Kelowna, Saskatoon, Calgary and Vancouver) and three in Ontario (Toronto, Guelph and Oshawa) and one in Atlantic Canada (St. John’s). Of the bottom 10 CMAs, seven were in Ontario (London, Thunder Bay, Greater Sudbury, Peterborough, St, Catharines-Niagara, Windsor and Brantford), one in Atlantic Canada (Saint John) and two in Quebec (Saguenay and Trois-Rivieres). Over the 10-year period, the four western provinces together created approximately 40 per cent of Canada’s new jobs, a proportion well above their national population share, which stands at approximately 32 per cent. With 23 per cent of the population and 23 per cent of Canada’s job growth, Quebec is right on the nose in terms of pulling its weight. Meanwhile, Atlantic Canada contributed 1 per cent of the employment growth but has nearly 7 per cent of Canada’s population, while Ontario, with 39 per cent of Canada’s population, only contributed 34 per cent of Canada’s employment growth. Aside from the West and Quebec, the rest of the country has not fared as well with their employment-creation relative to population.